Well, it’s Christmas Eve and anyone with kids knows what that means: children bouncing off the walls and waiting for Santa to come see them tonight. 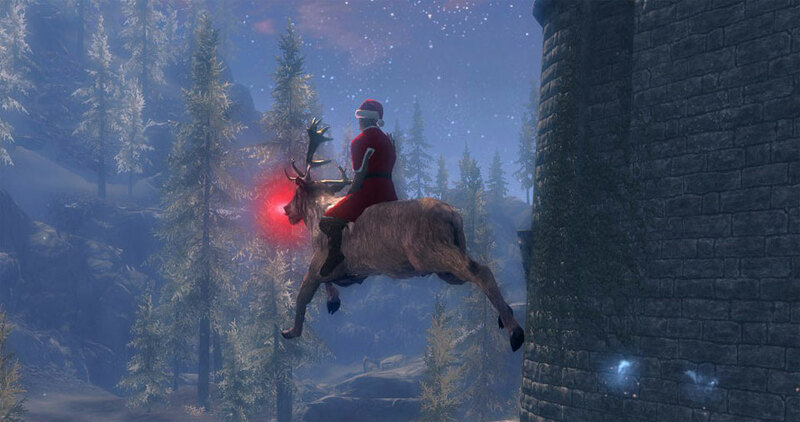 Santa is also coming to all the good girls and boy of Skyrim, specifically the NPC characters. PC Gamer has made a Santa character who rides a big reindeer with a glowing red nose. You know the most famous reindeer of all. In the game Santa is called “Krys Krynn-Gul,” and he is using some magic like door unlocking spells to get access to NPC abodes and leave gifts behind.